This reversible jacket is made from a single pattern piece! 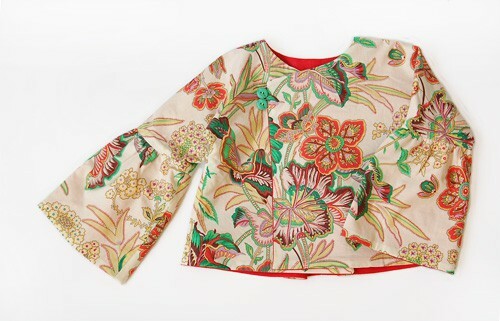 Add the sleeve ruffle for a sweet, feminine version. Includes a crossover closure with elastic button loops and a pleat with a locker loop at the center back. Share your photos on Instagram with the hashtags #fireflyjacketpattern and #oliverands. 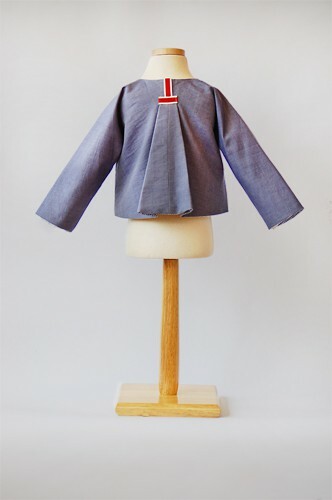 After successfully sewing this pattern, you will have developed the following skills: gathering and reversible garment. Light- to medium-weight woven fabrics like quilting cotton, broadcloth, shirting, poplin, chambray, linen, and flannel. Note: Not recommended for directional prints or napped fabrics. Coordinating thread, scrap of lightweight fusible interfacing, four 3/4" buttons, 8" of narrow elastic or ribbon (four hair elastics will also work), 8" of 5/8"- to 1"-wide ribbon. Chest 22" 23" 24" 25" 26" 27"
Length* 10 1/2" 11" 11 1/2" 12" 12 3/4" 13 1/2"
Sleeve* 12 1/2" 13" 13 1/2" 14" 14 1/2" 15 1/2"
Chest 28" 29" 30 1/2" 31 1/2" 33" 34"
Length* 14 1/4" 15" 15 1/2" 16 1/2" 17 1/2" 18"
Sleeve* 16 1/2" 17 1/2" 18 1/2" 19 3/4" 21 1/4" 22 3/4"
Thoroughly enjoyed making this jacket for my granddaughter. She loves it and I have noted to make her 2 more different styles that she can wear with jeans. And, to top it off, it looks great! 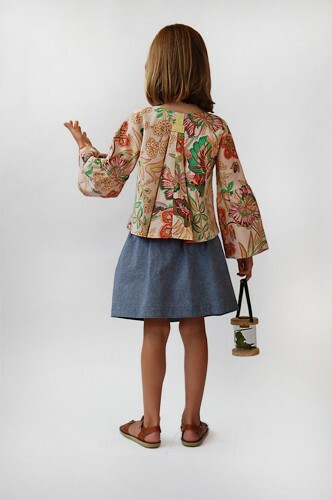 My grandchildren have all outgrown the firefly jackets I sewed for them a few years ago, and they're asking for new ones, so I ordered the pattern in the larger sizes and am enjoying it all over again. 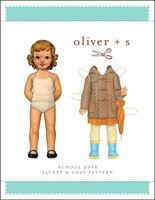 All of the Oliver and S patterns are great, but this is one of my favorites. 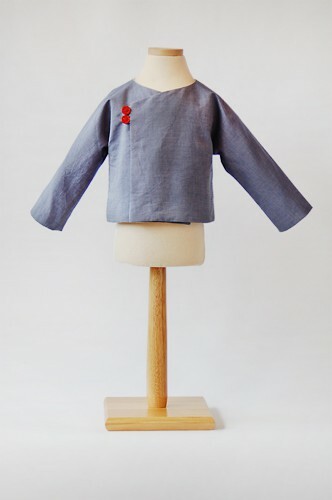 Its simple and elegant, but also playful - and fun to sew. Thank you Liesl for your terrific designs, your excellent instructions, the reliability of your sizing, and the joy and inspiration you bring to so many kids and grownups. Easy to sew, sizes larger than ready-made! I made this for my 1 year old. It was very easy to follow and great pattern overall, just wish I had attempted to get her measurements before hand. Sleeves seemed a little too long. I've been wanting to make this jacket ever since it was launched, but because we don't have much call for warm clothing, have had to wait for an interstate trip with cooler climes to sew this. The pattern was easy to put together from the pdf; the instructions well written and easy to follow. I did have to change the length of the ribbon because it was too short for the buttons I chose. I am very happy with the final result. 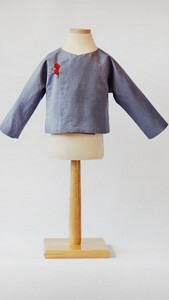 This jacket is worth sewing just to learn the sleeve finish, ingenious! I made this up is a heavy wool crepe as an emergency jacket for my eldest daughter we had a cold snap. So quick to sew. I think it would be the perfect cover up for a flower girl, dressier then the traditional cardigan. I long for a wedding invite so that I can make it in silk. Do take the time to transfer the button marking before sewing. I didn't and struggled to get them just right. 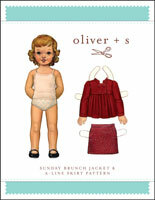 Oliver+s do digital patterns so well. The pieces fit together perfectly and I find the instructions printed on pages easier to follow then the unfolded sheet from the traditional paper pattern. A lovely little o+s 'fix'. 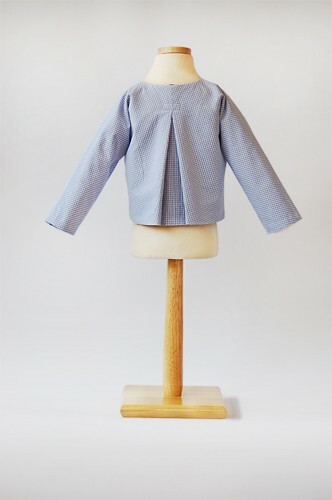 Discussion on the digital firefly jacket sewing pattern from the Oliver + S Discussion Forums. Find and share more photos on Instagram using the hashtags #fireflyjacketpattern and #oliverands.